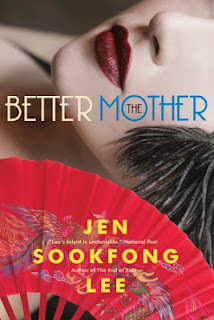 RUMMAGING THROUGH TIME IN Vancouver between 1958 and 1982, Jen Sookfong Lee’s The Better Mother is a tale about the unconventional friendship between two strangers. The initial meeting of the two dynamically different characters takes place in 1958 when Danny Lim, a lost little boy finding his way through town, encounters Miss Val for the first time. Miss Val, a former burlesque dancer, disguising herself as “oriental,” captures Danny’s attention through her glamorous and intriguing demeanor. Danny finds himself in awe of Miss Val as she generously hands him a packet of cigarettes to replace his father’s lost pack. While doing so, Miss Val also hands Danny a green silk belt, a pivotal moment in the story. Not much happens in terms of action during the opening pages of the novel; however, Lee captures the reader’s attention through her creative introduction to the mood, setting, and characters of the storybook. Following the prologue where the two main characters first meet, The Better Mothermoves into the year 1982, and remains there for the entirety of the novel, although occasionally moving back in time through a series of flashbacks. As seen in the example above, Lee uses her imagination to the fullest and though she can be verbose at times, carefully creates a vivid imagery which remains in the readers mind. However, as stylistic as Lee’s writing may be, it is not exclusive to a few flaws. Let me start by saying there is a revelation that occurs in the beginning of the novel, a characteristic that was not exactly specified earlier on. And my issue is not with the sexual orientation that is allocated to this particular character, but lies with the fact that Lee does not paint this section of the novel creatively. Firstly, the revealing moment of the character’s sexual orientation comes as a complete shock to the reader, and Lee fails to make this important disclosure exciting. Secondly, she further goes on to describe, in detail, sexual encounters that the character has. And while elsewhere Lee uses her imagination artistically, here the particular scenes not only lack any sense of affection but are inserted into the novel needlessly. I understand the character’s loneliness and alienation from society, and even understand his longing for intimacy, but why was there such a need to be so descriptive and detailed about it? However leaving that issue aside, the biggest problem with The Better Mother is that there is no real sense of urgency in the narrative, as most of the story involves the characters internally thinking about their past and/or problematic lives, but doing precious little about it. Danny starts out as interesting and very likeable, but somewhere down the road I personally stopped caring for him, due to his selfish and self-involved nature especially towards his family, good friend, and lover. Nevertheless, near the end of the book, Danny finally starts to change for the better and his resolution in the final section of the novel is inspiring. Val, on the other hand, is a more likeable and accessible character throughout the story, especially as her journey from a young girl maturing into a woman is filled with more twists and turns than Danny’s back-story. Also, it must be noted that the supporting characters in the novel created by Lee are well-developed, interesting, and engaging. Overall, the novel has many positive qualities that should not be overlooked. The descriptions used by Lee are vivid and full of imagery and ultimately save the novel, making it a worthwhile read. A significant example of this is seen when the character of Val is subjected to physical abuse by a forceful random male and Lee portrays this scene as nothing short of heartbreaking. Another instance which showcases Lee’s ability as a writer is when the opening moments of the book are retold from Val’s perspective. In doing this, Lee intelligently proves how the same conversation between two people can be understood from separate viewpoints. Finally, there is a confrontation between Danny and his good friend Edwin and afterwards when Danny apologizes for his earlier actions it is followed by Edwin’s wise response. Alone in this event, Lee shows the catastrophic affects of long-built anger getting in the way of friendship, followed by a hesitant apology and calm forgiveness. If the reader should find him or herself analyzing the novel upon completing it, they will surprisingly discover that many topics are impressively brought forth by Lee throughout its duration, such as: immigrant life, friendships, loneliness, homosexuality, AIDS, love, relationships, burlesque, single pregnant women and even marriage. Looking at all of the above, Lee has proven capable of writing a commendable novel by taking the lives of two distinctly different characters and making an ambitious tale chronicling many years of their lives. Despite some minor flaws, Lee’s writing not only reveals the scope of her imagination, but also her ability to capture and express moments of great detail in the most wondrous ways.